Find all you need to know about Frankfurt am Main for a pleasent and all covered trip, with a chance to find your desired accommodation in the city. With towering glass-and-steel skylines and over 300 banks, Frankfurt seems more like a business center than any other German metropolitan city. Its names as Mainhattan and Bankfurt indicate this fact very clearly. But behind all the shine and luster, Frankfurt is indeed a German city at heart. Despite its complete destruction in World War II, the city has regained its charm and popularity as a captivating Hessian town, just with more big-city trimmings. The Old Town of Frankfurt is a classic example of architectural resurrection at its best. The more you travel around this city, the more you’ll discover how much of a façade its business-hub appearance is; the city is nothing like other popular metropolitans of the world. Frankfurt is a maze of cobblestone streets and squares that are lined up with townhouses, palaces and medieval churches. Older traditions of keeping beer gardens, putting up street markets and presenting Teutonic opera are still very much alive in the city. The modern bistros and fashion houses gel in with these traditional structures quite flawlessly, giving the city a perfect retro-chic appearance. There is a lot you can see and do in this 2000 year old beautiful city that preserves the history of all those years very dearly. Frankfurt Am Main is truly a wonderful city in every aspect. You can enjoy the feel of big cities while experience small town-living simultaneously in this amazing German city. Whether you are in the city for business or for leisure, you are definitely going to have a memorable time here, exploring and relishing the centuries-old culture that still lingers in Frankfurt. Where is Frankfurt Am Main? 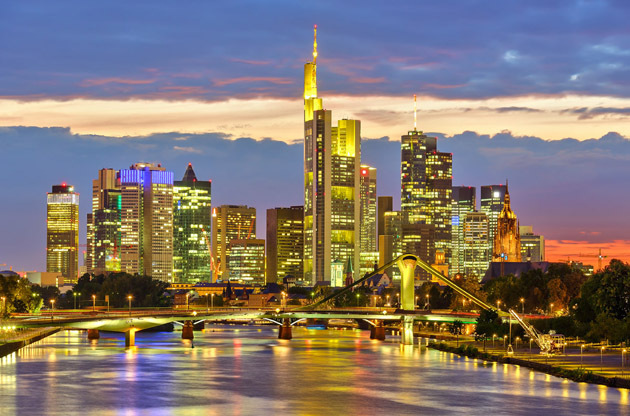 The city of Frankfurt is located in the state of Hessen in southwest Germany, right along the Main River. How to get to Frankfurt Am Main? The best way to get to Frankfurt is by air since the city has two airports. Frankfurt Airport is the second largest passenger airport in Europe and offers a range of international and domestic flights every day. Frankfurt-Hahn is a smaller, low-cost airport that also offers several flights into the city. Frankfurt is also home to the most important rail hub of Germany, Frankfurt Central Station. More than 1,100 trains connect to this station every day coming in from national as well as international locations. While you are in Frankfurt, you are not likely to have a dull moment. The city is full of attractions, activities and interests for everyone. Whether you are there to explore the culture, do some business or have an adventure, you can find something that interests you. One of the must-visit places in Frankfurt is the Main Tower of the city. This is the highest building of town and can give you a 360-degree view of Frankfurt from its top platform, built 200-meters above the ground. At night when the city is all lit up, it creates one of the most captivating views that you just can’t miss while you are in the city. If you are looking to enjoy some classic performances after that, you can visit English Theater, Oper Frankfurt or Alte Oper (Old Opera House). For a glimpse of city’s old cultural values and its glorious historic past, you can head to Frankfurt Romans. This site is Frankfurt’s city hall since 1405, and remains a defining symbol of this ancients city’s rich past. Senckenberg Natural History Museum is the best history museum to visit in the city where you can spend hours on end without getting bored. From dinosaurs to stuffed animals, the museum displays the evolution of world at its best. If you want to enjoy the natural beauty of the city, you won’t be disappointed since there is much to see. One of the best places to visit is the Palmengarten, the beloved botanical gardens of Frankfurt. The gardens occupy 50 acres of land that are filled with orchids, tropical trees and ferns of all types. You can get on top of the Main Tower to get a 360-degree view of this German city, you can visit the many galleries of Frankfurt, or you can go to the German Film Museum to catch a screening. The St. Bartholomeus Cathedral is an old gothic perseverant structure that has gone through extensive reconstruction attempts twice since 14th century and is a beautiful architectural masterpiece. The more you discover this city, the longer you want to stay. Fine dining options are varied in Frankfurt, and you can enjoy some of the most lavish meals of your life in the city. If you are looking forward to European cuisine at its best, Weinsinn is the place for you to visit. The restaurant offers some of the most scrumptious meals in the whole of Europe so make sure you get a reservation. For some nightlife fun, there are several bars and clubs in the city that can catch your attention. One of the best places to visit is Jimmy’s Bar. A classically-styled German bar, this is a fun place to be. Paneled walls, an assortment of cigars and wonderful cocktails will keep you hooked to this bar. 22nd Lounge Bar and Roomer’s Bar are two other popular clubs in the city where you can have a great time. If you are looking to shop in the city, the best small markets to visit are Schillermarkt and Kleinmarkthalle. The former is a small farmer market while the latter is a flea market, best for picking up some nice souvenirs. If mall shopping is more your style, you can visit Bauernmarkt Konstablewache, MyZeil and Zeilgalerie. All of them are big and nice malls in the city where you can find almost everything you are looking for. Berger Strasse and Oeder Weg are the places in the city where you should head for less commercialized shopping. In addition, Brückenstraße in Sachsenhausen is the rising star of shopping in the city. If you are after buying some Prada or Burberry or any brand on the sam range, then go to Goethestrasse and the Fressgass. Zeil area has been the heart of all kinds of shopping for quite a long time in Frankfurt now. You have a bunch of options if you would like to make a side trip while you are in Frankfurt am Main. Rhine River Valley is a top destination for the visitors that have at least one more day to stay. In addition, Black Forest and Strasbourg, Heidelberg and Eltz Castle welcome a large numer of visitors who come to Frankfurt in the first place, too. The beauty and the unique aura of Frankfurt am Main is the major reason of the increasing number of the visitors, that is for sure. However, we cannot underestimate the contribution of the important large scale events' to the popularity of the German city. Frankfurt becomes the home for a great number of international congresses, conferences, symposiums, seminars, tradeshows and fairs every year. The accesibility of the venues and the quality of the hotels, when combined with the elegancy of the city, turns Frankfurt into one of the best cities to hold these kind of events in all Europe.